One of the most frequent questions we are asked is “What is patina?” It is one of the most difficult things to describe, and yet it is that extra ingredient which transforms the surface of a piece of furniture from the ordinary to the exceptional. Put simply, patina is the surface formed by a combination of the ageing processes caused by rubbing, dusting and waxing, coupled with oxidisation of the wood and the action of the sun’s rays, producing a bronze-like lustre, or “skin”. The flat yellow colour of walnut becomes golden and “honey-coloured”, with wonderful depth. Oak richens from dull grey to a deep, dark brown. Mahogany loses its reddish hue and softens to lovely gradations of brown, golden and grey. Finally, the dirt and dust of years which clings to corners plays its part by highlighting the paler, mellow surfaces; even the natural grease from fingertips which darkens areas around handles is an important factor. Patina cannot be reproduced by the makers of fakes, and its qualities are an intrinsic part of the value of an antique. It takes two hundred or so years to form, but can be removed in an instant by the use of cleaners by unskilled restorers. Here in the Thakeham Furniture workshops, our team specialise in the preservation of patina. 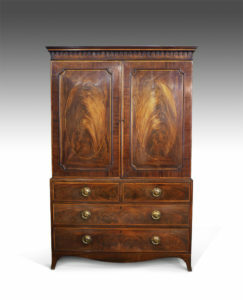 One of the finest examples we’ve had of patina recently is this beautiful quality George III linen press, dating from about 1790. The vivid colours of the decorative veneers and inlay have faded to a mellow hue, and it has a wonderful waxy sheen. The majority of miniature furniture are in fact sample pieces used by travelling salesmen. Workshops would send out salesmen on lengthy country-wide tours, with a miniature of each piece on his sales cart. This meant the cabinet maker could use the smaller form to show off his skills, without the salesman having to lug a full size piece of furniture wherever he went! Using exactly the same skills and techniques as used on the full sized pieces, the miniatures offered a fantastic way of potential buyers being able to get a feel of the quality of goods the workshop produced, before committing to a purchase… much better than a sketch in a catalogue! A much smaller number of these miniatures are what was called ‘apprentice pieces’. Apprentice pieces, although again a scaled down version of the workshops’ offerings, were made by an often inexperienced apprentice. 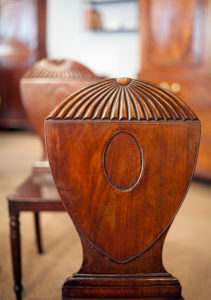 They were given lesser quality materials to work with and the craftsmanship was often less refined. Both miniatures and apprentice pieces are highly desirable and collectible antique items in today’s market. They are rarer than the real thing, and the charm and precise craftsmanship of these exquisite pieces is undeniable. 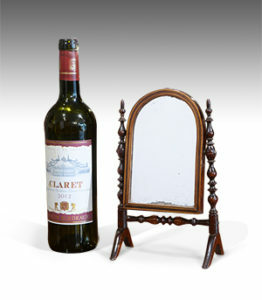 These days they are often used as collectors’ chests and jewelry boxes etc., and make a wonderful gift! When people come into our workshops here at Thakeham Furniture [visitors are always welcome], one of the things that astonishes them is the sight of a traditional ‘glue pot’ containing hide or ‘Scotch’ glue, such have been used in workshops since the 17th century! Scotch glue is an adhesive, similar to gelatin, that is created other by prolonged boiling of animal hide, and it is used hot. It comes in the form of pearls, which are first soaked in water; the technology of the glue pot, however, has moved on: we use an electric double skin device. Why not use modern, synthetic adhesives? Well, there are several answers to this question. The first, and most important, is authenticity. 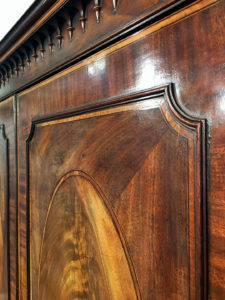 When working on antique furniture you should never introduce materials that were not around when the piece was first made; for example, we have a wood store of old timber, so that we never have to use ugly modern mahogany in a repair. Scotch was what was used when the piece was made. The second reason would be strength and reliability. Hide glue also functions as its own cramp. Once the glue begins to gel, it pulls the joint together. Cabinet makers may glue two planks together by using a rubbed joint rather than using cramps. 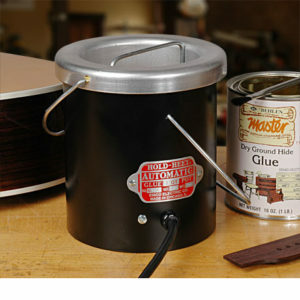 This technique involves coating half of the joint with hot hide glue, and then rubbing the other half against the joint until the hide glue starts to gel, at which point the glue becomes tacky. At this point the plate is set aside without cramps, and the hide glue pulls the joint together as it hardens. The third reason is convenience – hide glue is very forgiving. It is water soluble, so it can be washed off easily. Haven’t managed to wash every scrap of old glue off before re-gluing an old joint? It doesn’t matter: the new heat of the new glue will soften up the old and they’ll combine nicely. Working on a piece that was restored by a cowboy last time? If they used a synthetic glue you will be cursing them, as anyone who has spent hours picking tiny scraps of Cascamite out of a joint will testify. A bonheur du jour (in French, bonheur-du-jour, meaning “daytime delight”) is a type of lady’s writing desk. It was introduced in Paris by one of the interior decorators and purveyors of fashionable novelties called marchands-merciers about 1760, and speedily became intensely fashionable. 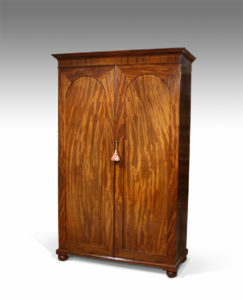 The bonheur du jour is always very light and graceful, with a decorated back, since it often did not stand against the wall (meuble meublant) but was moved about the room (meuble volant); its special characteristic is a raised back, which may form a little cabinet or a nest of drawers, or open shelves. The top, often surrounded with a gallery, serves for placing small ornaments. Beneath the writing surface there is usually a single drawer, often neatly fitted for toiletries or writing supplies. Early examples were raised on slender cabriole legs; under the influence of neoclassicism, examples made after about 1775 had straight, tapering legs. The French had the idea of mounting bonheurs du jour with specially-made plaques of Sèvres porcelain; the earliest Sèvres-mounted pieces are datable from the marks under their plaques. Other choice examples of the time are inlaid with marquetry or panels of Oriental lacquer, banded with exotic woods, with gilt-bronze mounts. By the mid-1770s the bonheur du jour was being made in England, where it was often simply called a “lady’s writing-desk”. This particularly fine Scottish example is in finely figured rosewood, with decorative boxwood stringing. The folding writing surface opens to reveal the original tooled leather and inset pen and inkwell trays. 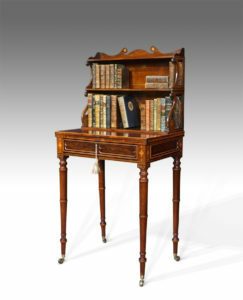 The scrolling shelf supports contribute to the overall elegance of the piece, which dates from about 1810. Thomas Chippendale’s ‘The Gentleman and Cabinet-Maker’s Director’, 1754, featured the first designs for the hall chair. 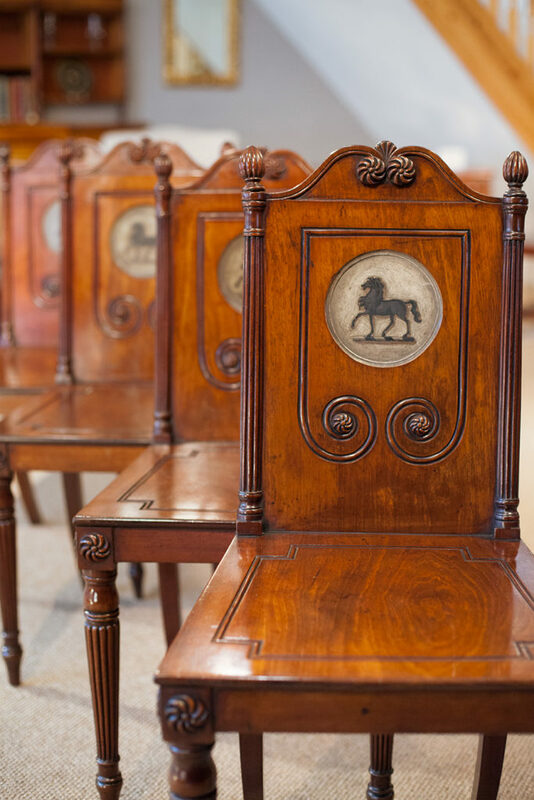 The backs, carved from solid wood, were often painted with the family’s coat of arms and motto, which these days allows for provenance to easily be traced. They feature a solid hardwood seat, allowing for it to be easily cleaned. Hall chairs are not to be confused with porter’s chairs of the same period, which were designed with a cocoon like back to exclude draughts. 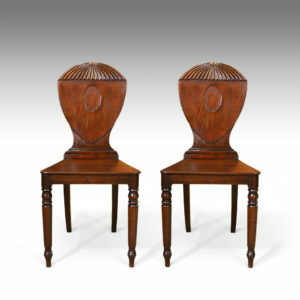 In recent years there has been a surge of popularity in Hall chairs. Alongside the robust design, and clean, architectural aesthetic, the chairs often come in pairs; creating a pleasing symmetry when placed either side of a console table in a hallway. The term ‘gilding’ covers a number of decorative techniques for applying fine gold leaf to solid surfaces such as wood, stone, or metal to give a thin coating of gold. A gilded object is described as ‘gilt’. 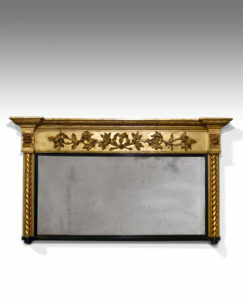 Where metal is gilded, it is traditionally known as ormolu, and was used for furniture mounts, mostly by the French. Parcel-gilt (partial gilt) objects are only gilded over part of their surfaces. The use of gilding dates back to Egyptian times, and has always been valued for its beauty, its highly skilled techniques and opportunity to display wealth. Specialist tools and equipment are needed: a gilder’s cushion, tip and knife. The cushion is a small padded board covered with suede, with a screen made of 4in high parchment or brown paper attached along one end of the cushion and halfway down both sides: this prevents the gold leaf being blown off, as it will do in the slightest draught. The gilder’s tip is made of fine brush hair and is used for moving the gold leaf: the tip is rubbed against the face or hair to produce static, which is then used to lift the delicate leaf onto the cushion for cutting. Beneath the gold are the layers of gesso and bole. Gesso is composed of fine plaster of Paris and animal glue size – traditionally made from rabbit skin. It is applied with a brush, like paint, layer after layer, until the correct thickness is achieved. The Armenian bole, the final layer, gives a richness to the gold: it resembles reddish clay – due to the presence of iron oxide – and is again mixed with size. The surface is burnished with an agate burnisher to an almost mirror finish. This is then wetted, to activate the size, and the gold leaf laid on top. When it is perfectly dry the excess leaf is brushed away and the surface burnished again to make the gold shine. Gillows of Lancaster was established by Robert Gillow in 1728 and continued by his two sons. 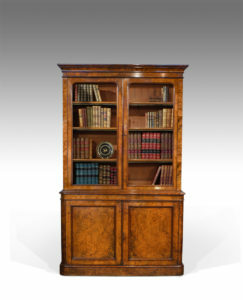 They were a unique firm: no other cabinet makers were in business for so long a period, and no other provincial firms had a showroom and workshop in 18th century London; they were responsible for some of the finest pieces of English cabinet work during the late 18th and early 19th century. They had a wide range of clients, from aristocracy to the merchant classes. 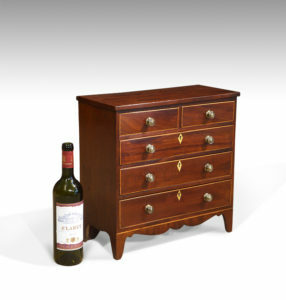 All designs were practical and of the best materials, and above all was the quality of design craftsmanship: two hundred years later drawers still glide in and out smoothly. This two door wardrobe, circa. 1850 and stamped “Gillows”, is a fine example of this first class craftsmanship. Although well over 150 years old, it has really stood the test of time.. the drawers run smoothly, the linings are incredibly clean, and there is no warping or movement – everything fits in its place neatly and flush. 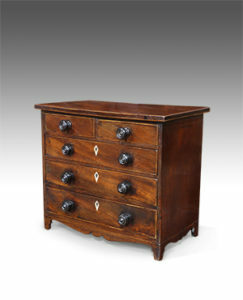 Another example of Gillows furniture currently in stock is this 18th century serpentine chest of drawers. Again, beautiful quality, the oak drawer linings are crisp and clean, and the lovely small dove tail joints are clearly the work of a highly skilled cabinet maker. 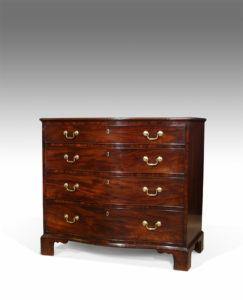 Serpentine front chests always are always held in high esteem, due to the extra work during construction. Deportment chairs – The original naughty step! Invented by Sir Astley Paston Cooper (1768-1841), a surgeon and anatomist, deportment chairs were designed to correct poor posture in children. It was considered dignified for a child to have upright posture, with a straight back and the head held high. It was believed this was important not only for discipline, but also medical reasons. Children in a Victorian classroom or nursery would be sent to sit on the deportment chair when they were naughty. It was seen as a form of punishment, as the nature of the design (small seat and upright back) meant the child was forced to sit very still; if they were to fidget or slouch, they would inevitably fall off. This Victorian example is in fine original condition; with decorative features the carved lyre shaped splat. 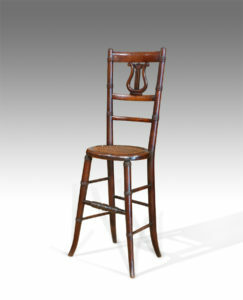 The typically small seat is caned, and raised on very elegant ring turned splay legs.